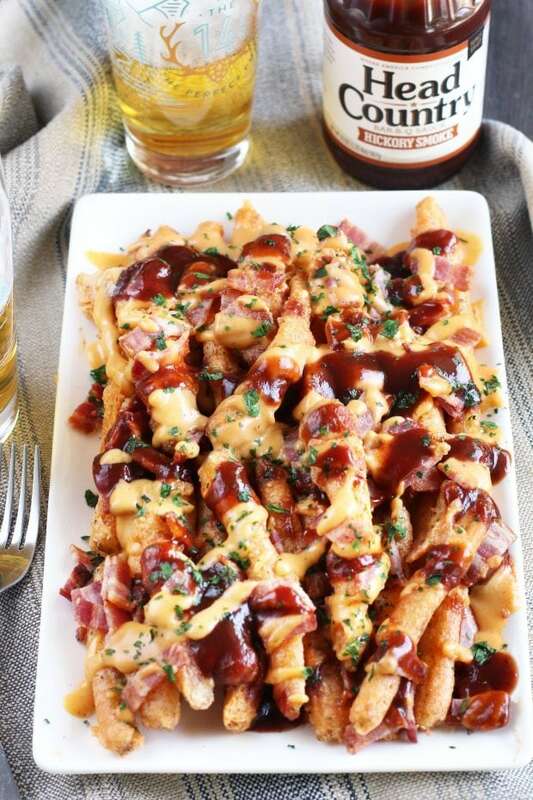 BBQ Bacon Crack Fries are the most epic combination of beer, bacon, potatoes, cheddar, and BBQ sauce you’ll ever put in your mouth. They are smoky, savory, spicy, and crispy, making them ideal for inhaling as you watch the big game. Let’s kick off tailgating season on the right foot, shall we? Honestly, how are we already about to kick off all things fall? I am slowly losing my mind thinking about how quick this year is passing by. Before I know it we will be ringing in the new year and I’ll be wishing I hadn’t eaten so much over the last four months. 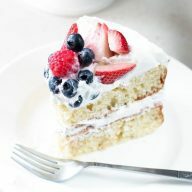 But until that day comes, I am going to stuff my face with as much deliciousness as I can get my hands on. 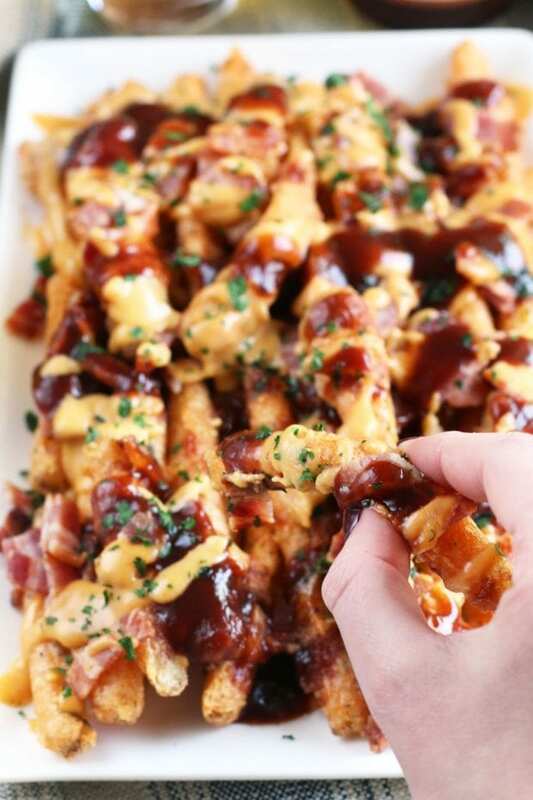 Nothing says fall to me like tailgating grub, and that means it’s time for all things BBQ. As you all know, my Head Country Bar-B-Q obsession runs deep. From their flavorful sauces to their creative seasonings, I constantly have their products on my pantry shelves (especially now that I am organizing my pantry!). This plate of beer-battered crack fries is pure. bliss. 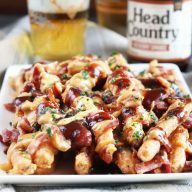 You start with extra crispy fries that have been dredged in a beer batter, making them a little puffy and crisp, but melt-in-your-mouth delicious on the inside. 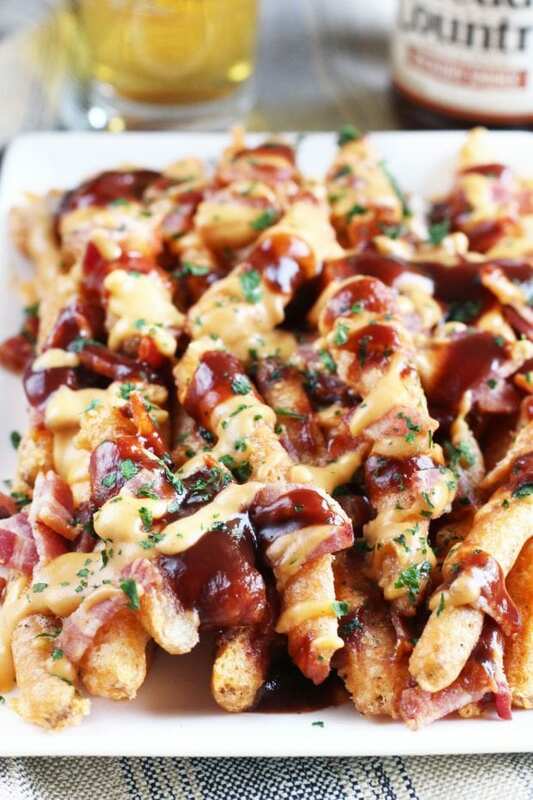 After that, you move to the spicy cheddar cheese sauce and bacon that top the fries. Just a hint of spicy punctuates each bite and the crisp bacon provides a whole new level of umami to each bite. 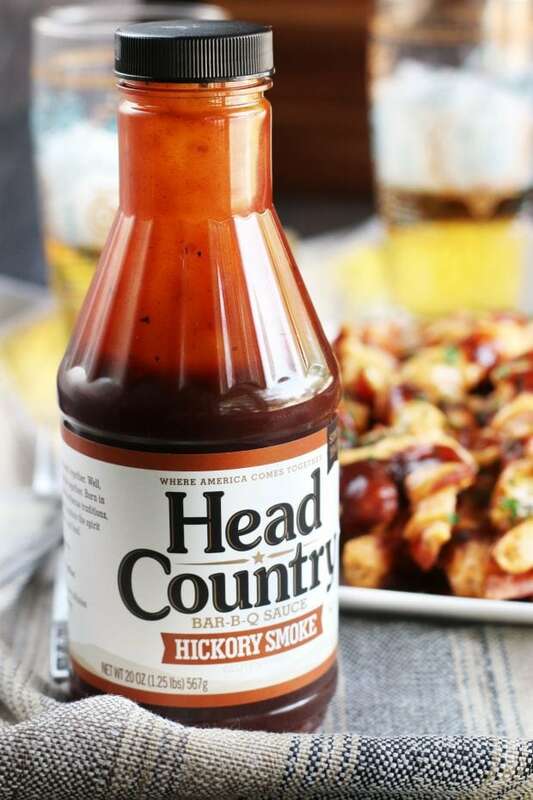 Then, you have a tangy, smoky blast of flavor from my new favorite sauce – Head Country’s Hickory Smoke BBQ Sauce! 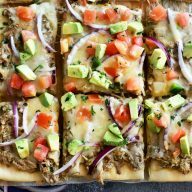 They are ideal for serving up to snack on as the big game gets started, or to sit on the patio soaking up the last bits of summer with a cold beer in hand. 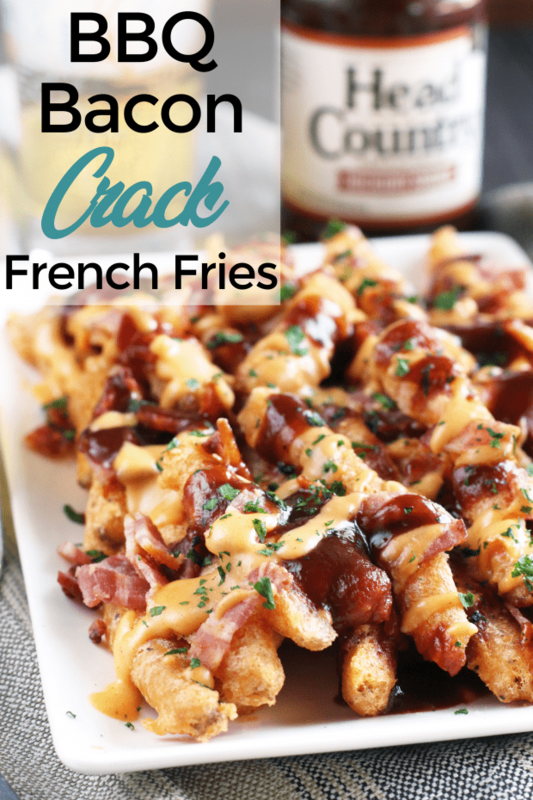 Why do you call them crack fries? Great question! 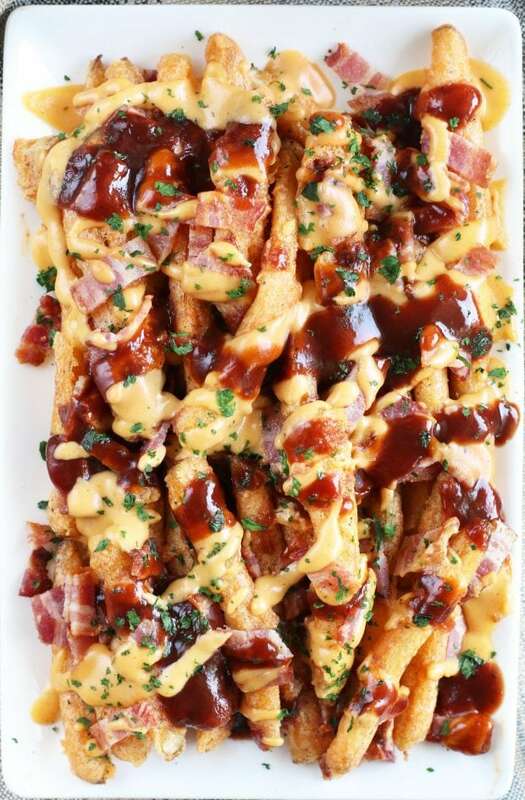 I personally like to call any fries that are taken to an insane level with toppings crack fries. Because they are like crack. You literally can’t stop shoveling them into your mouth. Not that I’ve done crack. You know, just to clarify. Want a preview on how to make this delectable dish? Check out the video below! to make this dish possible! You might want to grab a couple though, because once you taste it you are going to want to put it on eve-ry-thing. are the two tools I use for frying anything and everything. is my new favorite saucepan to whip up sauces like the cheese sauce you see in this recipe.
. I’ve been using mine for SO LONG and it is still pristine. 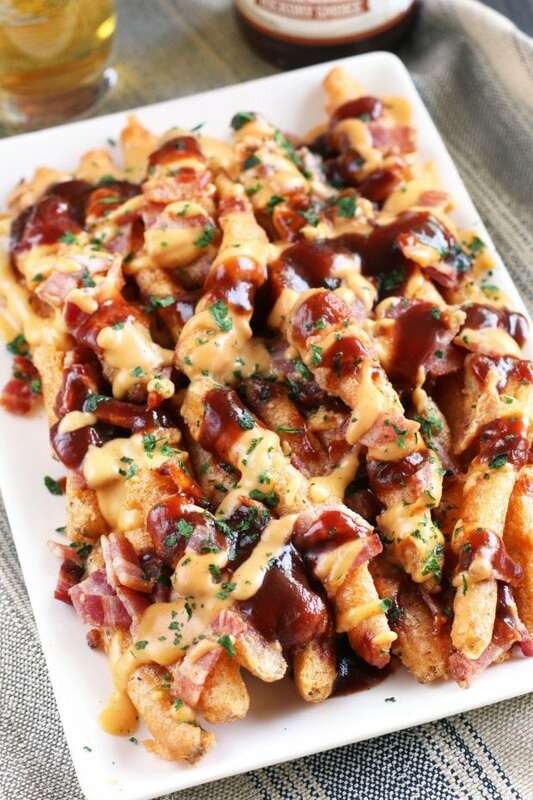 Pin this BBQ Bacon Crack Fries recipe for later! 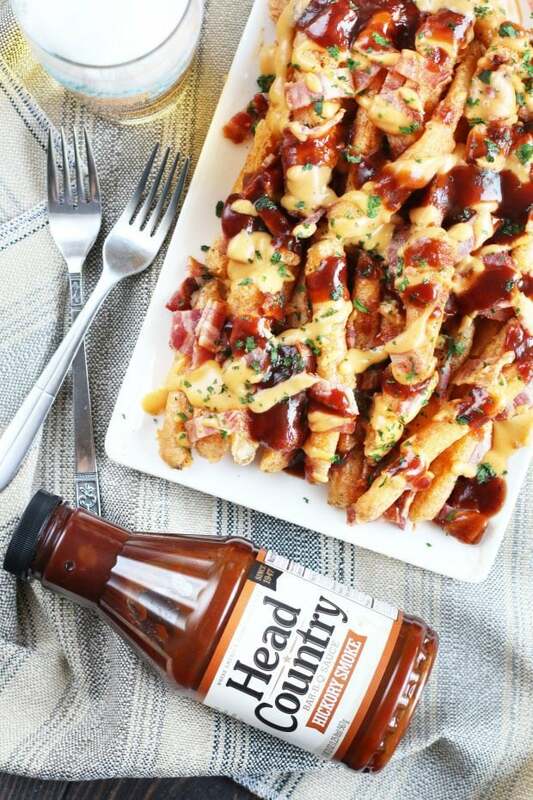 Beer battered fries are topped with a spicy cheese sauce, rich hickory smoke BBQ sauce, and BACON for an epic snack of pure indulgence. Fill a Dutch oven with 3 to 4 inched of oil. Heat over medium-high heat until a thermometer reads 325 degrees F.
Dry the potatoes with paper towels well. Working in batches, add the fries to the hot oil and cook until lightly golden, approximately 5 minutes. Remove from the oil to a paper towel-lined baking sheet. Season with salt and let cool for 30 minutes at room temperature. While the fries are cooling, making the spicy cheese sauce. In a medium saucepan over medium heat, melt butter with garlic powder, paprika and cayenne. Once the butter is melted and bubbling, stir in flour. Cook until browned, about 30 seconds to 1 minute. Whisk in milk. Cook until the mixture is thickened, approximately 2 to 3 minutes. Remove from heat and stir in cheese. Cover and keep warm until ready to serve. Return the oil to medium-high heat and increase temperature of the oil to 350 degrees F.
Dip the partially cooked fries into the batter to coat and then drop them into the oil. Fry the battered potatoes in small batches until browned and crispy, approximately 2 to 3 minutes. Remove to paper towels to drain. 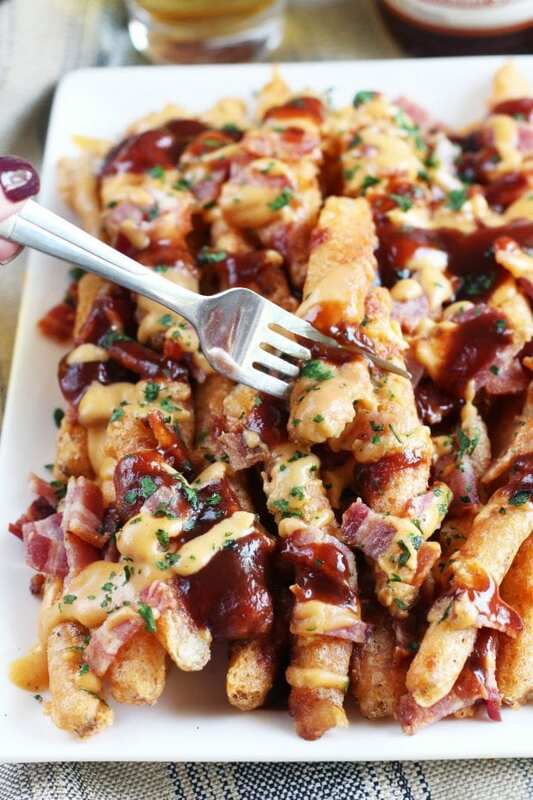 Add fries to a large platter to serve. 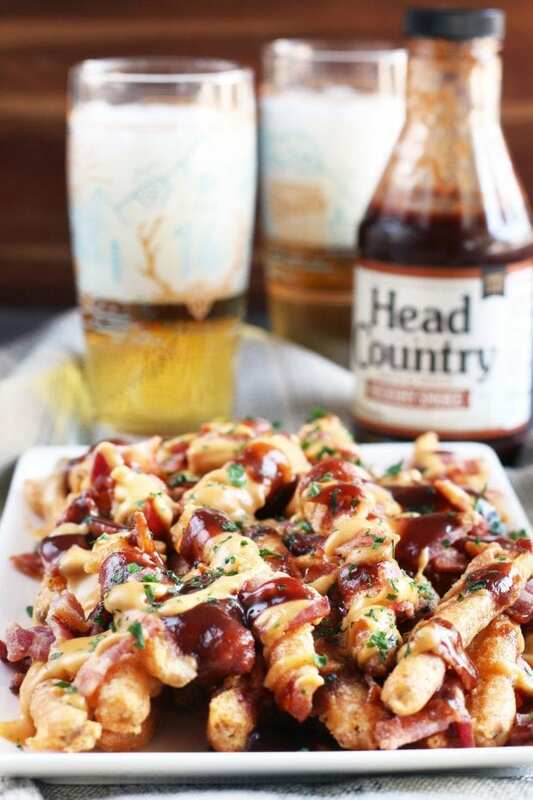 Top with chopped bacon, cheddar sauce, and Head Country Hickory Smoke BBQ Sauce. Sprinkle with parsley and serve immediately with cold beer. OMG These look so good to me right now. Mostly I want to guzzle the spicy cheese sauce.